Tell me if this sounds familiar: The classic Air Jordan XI midsole and outsole paired with a more lifestyle-ready upper, one that would initially be launched in just two colorways but eventually be seen in many more. 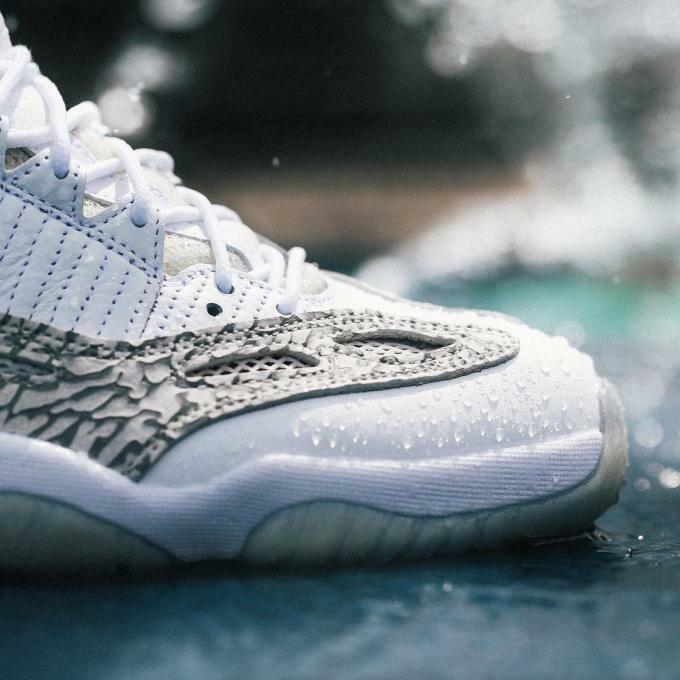 No, not 2014’s Air Jordan Future, 1996’s Air Jordan XI IE Low. 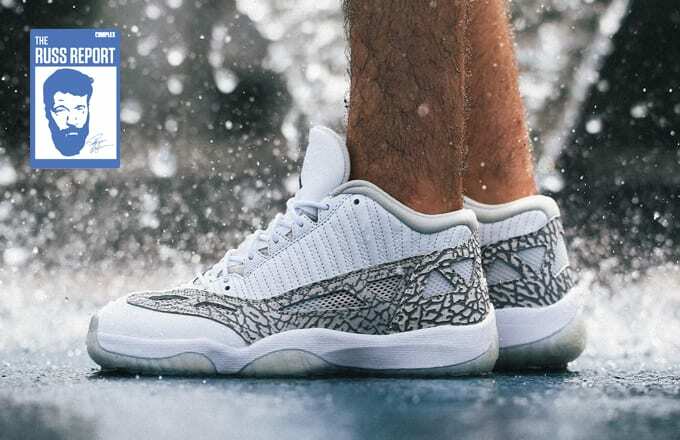 Everything old is new again, yes, but more than that, the Air Jordan XI IE Low—which returns again this weekend in the initial white/cobalt/grey colorway—represented something of a change of direction for Air Jordan, one that would be solidified the following year as Jordan broke off from Nike to become its own company. The IE Low proved that an Air Jordan model not primarily known as an on-court shoe (although Jordan did wear it in the ‘96 Playoffs) could still be viable, and that the flagship performance model could serve as a jumping-off point for something else. Here’s something else the IE Low did: It re-introduced elephant print to the Air Jordan canon. This may seem insignificant now that’s it’s been used on seemingly every silhouette Jordan (and Nike) can think of, but back then this was a bold move. Air Jordan had always been about looking ahead, with most design elements, no matter how iconic, used once then shelved for something else. Think of the 3M tongue of the Air Jordan V—progress was linear, ideas weren’t re-used. Elephant print on the IE Low changed all of that. It flipped the entire idea of what a “new” Air Jordan could be on its head. There are Air Jordans you buy to flex, there are Air Jordans you buy because you feel like you have to own them, there are Air Jordans you buy purely because of something Michael Jordan did in them. 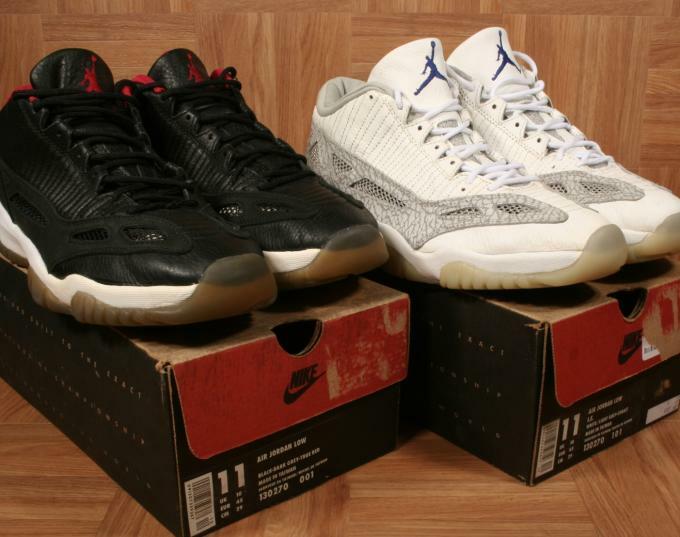 The white/Cobalt Air Jordan XI IE Low fits none of these categories. Which might be the best reason to buy it of all. 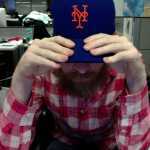 Russ Bengtson is a senior editor at Complex. &apos;The Russ Report&apos; appears every Friday and you can read previous columns here.